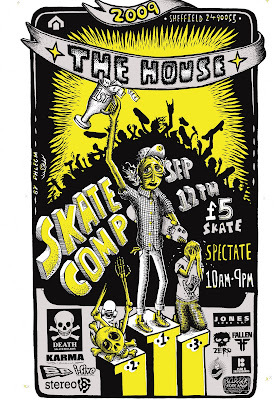 It only happens once a year.....here it is again, the house skate competition! 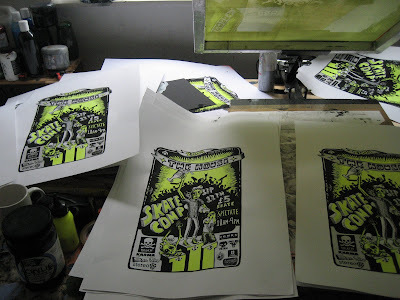 This year I've screen printed thirty or so posters for the event. These posters are for the shops and advertising of the event only so they are very limited...I've kept ten signed copies back in case anyone wants to buy one. Here is one on ebay if anyone wants to pick one up. They are all printed with speedball inks, neon, mettalic and matt black on heavy paper. signed. ps. Issue nine is stocked in most of the sheffield shops now. Special editions are at rare and racy and the old sweet shop. I'll start stocking the rest of the uk outlets next week.